If you’re not using a video popup on your site, you’re missing a golden opportunity to boost engagement, leads and sales. Did you know that half of all people aged 18-34 would stop what they’re doing to watch a new video? And that 45% of people watch more than an hour of video a day? Those two facts alone tell you that if you’re not using video in your marketing, you’re ignoring a large part of your audience. So how can you get the benefits of using video to engage your customers, while keeping your site speedy? We’ll walk you through the process step by step. One major advantage of using OptinMonster is that if you load the video inside a campaign, it won’t be hosted on your site, so site speed won’t suffer. OptinMonster also helps you create a responsive video lightbox, suitable for viewing on mobile devices. With an estimated 11 billion mobile devices in use by 2019, having mobile-friendly video popups is crucial. 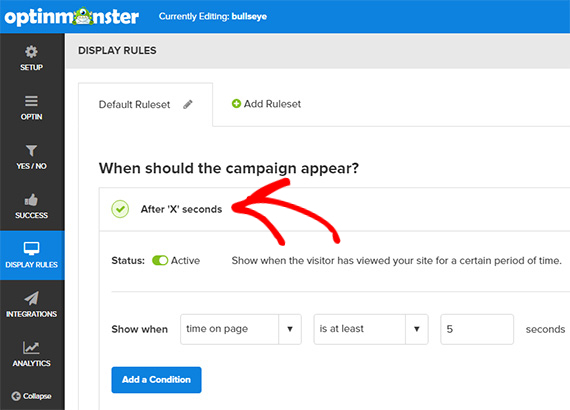 OptinMonster also has advanced targeting features (like page level targeting and campaign scheduling) that let you decide who’ll see your video popup campaign at what time, for maximum impact and engagement. And once your visitors are engaged, they’ll be more likely to opt in to your email marketing campaigns. In this guide, we’re going to show you how to create a video popup that grabs your visitors’ attention. We’ll also show you how to add that YouTube lightbox to WordPress. 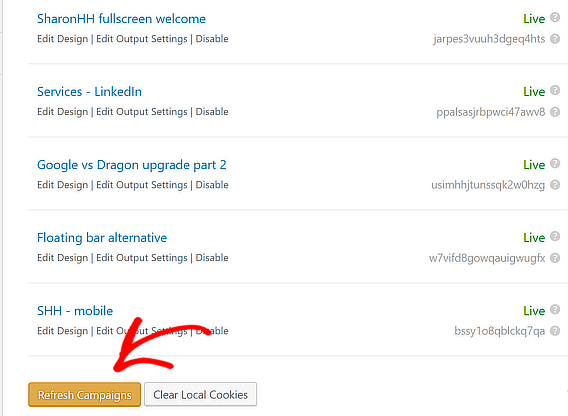 Log in to the OptinMonster dashboard, and click Create Campaign. Choose a campaign type. For this tutorial, we’ll use our high converting Lightbox Popup. Select a template. Our Theater template is ideal for video, so we’ll use that one. But you can also embed a YouTube video in any OptinMonster template. We’ll show you how later in this tutorial. Name your campaign, then press the Start Building button. 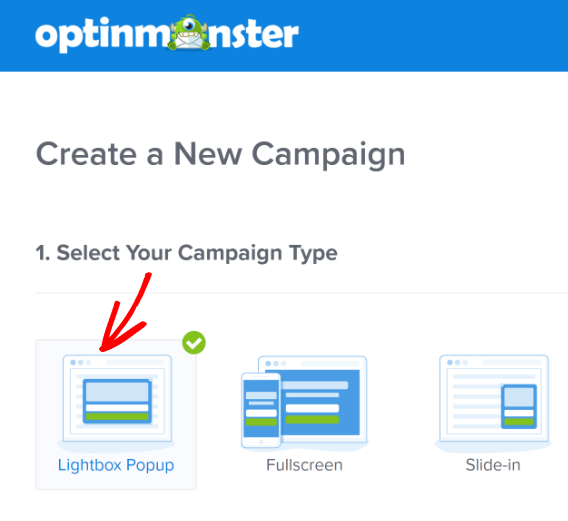 This will take you to the OptinMonster campaign builder to create a lightbox video popup. Inside the campaign builder, you’ll see a video lightbox pre-filled with an OptinMonster video. You’ll change that in the Step 4. First, let’s select where the popup should display. To do that, go to the Campaign Website field, and add the URL of the website where you plan to run your video popup campaign. 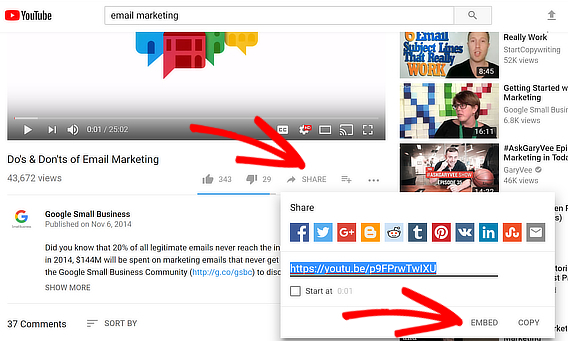 Next, you’ll want to get the URL for the video you want to embed. We’re going to use YouTube in this tutorial, but OptinMonster also works with Vimeo, Wistia and other video sites. Leave the campaign builder open, then open another browser tab. To get your code, go to YouTube and navigate to the video you want to embed. 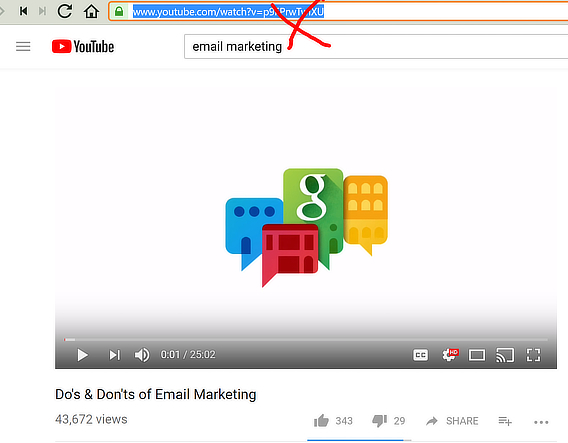 We’re using a Google video on email marketing. Copy the embed URL. This is NOT the URL in your browser’s address bar. 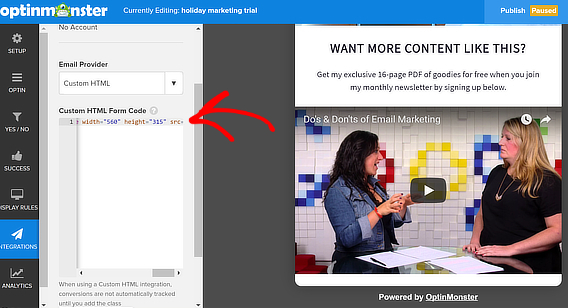 To find the correct code, click on Share, then select Embed from the popup box. Another box will pop up with a video preview on the left, and the code on the right. Set any additional options for the video, like starting at a particular time, or playing related videos. Here are some common options to try. When you’re done, copy the embed code. Note that you only need the URL part of the embed code, which appears between quotation marks. If you have trouble grabbing it on its own, copy all of the code to a text file, then select and copy the URL. Return to the OptinMonster campaign builder. Go to Optin, then scroll down to Design Fields. Enter the URL for the video in the Video Embed URL box. The campaign preview will update to show the updated lightbox YouTube video campaign. Next, you’ll want to specify when visitors should see your video popup campaign. To do that, navigate to Display Rules » When should the campaign appear? By default, After ‘X’ seconds is selected, which means that even if you forget to set a display rule, visitors will see your video popup after they’ve been on your site for a while. 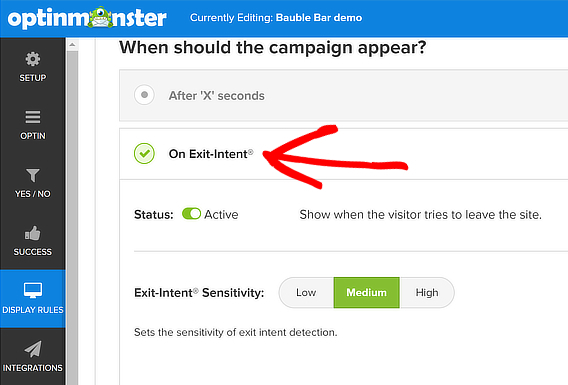 Another great option is to use OptinMonster’s signature Exit-Intent® technology, which detects when people are about to leave your site, so you can grab their attention with your video popup and keep them engaged. To enable this, go to Display Rules » When should the campaign appear. Enable On Exit-Intent. When you have completely finished, save your campaign. Then click on Publish to see publishing options. 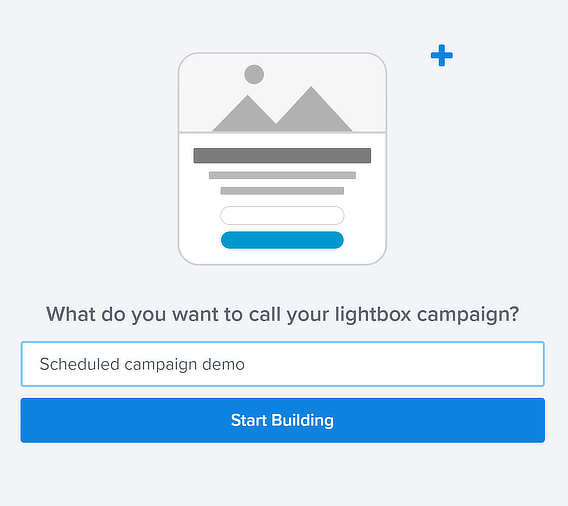 Click the toggle to make your video popup campaign live. Choose how you want to publish the campaign. 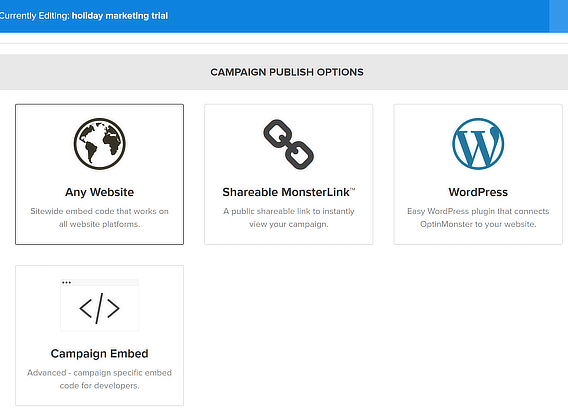 Your options are sitewide embed code, campaign specific embed code, a shareable MonsterLink™, or on WordPress. WordPress is a popular website platform, powering around a quarter of the web. OptinMonster works with WordPress, and many other website platforms, making it easy to create WordPress video popups. To add your video popup to WordPress, make sure you have installed the OptinMonster API plugin. After you publish the video popup campaign, go to your WordPress dashboard, and click on the OptinMonster icon. See if your new campaign is listed. If it isn’t, click Refresh Campaigns. Your campaign should appear in the list. If you want to change where your campaign appears on WordPress, you can do it here, by clicking on Edit Output Settings. 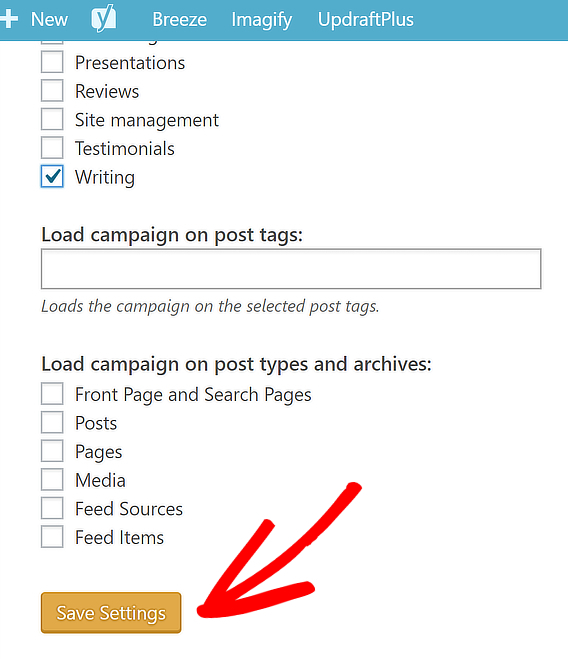 For example, you can set your campaign to appear only on certain post categories or post types. Once you have made changes, press Save Settings. Your WordPress video popup is ready to go. If you prefer not to use the Theater theme, there’s another way to create a video popup. You can use our Custom HTML integration with any theme. To do this, follow the instructions for creating your first campaign. Go back to YouTube and follow the steps to get the embed code. This time, you’ll need the complete embed code. 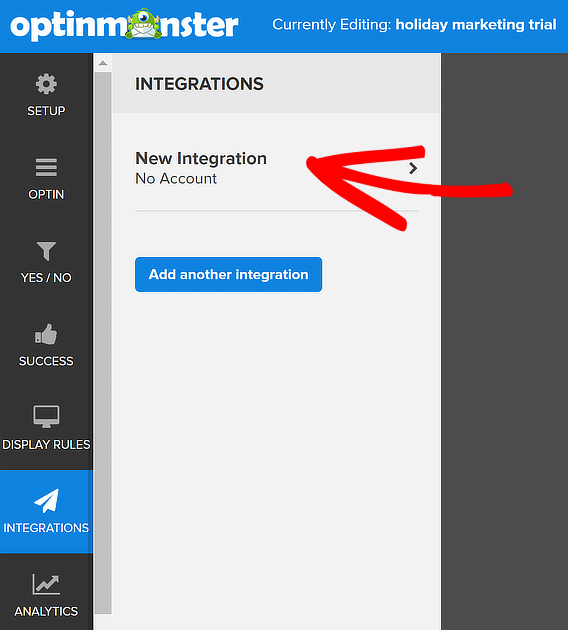 Go to the Integrations tab. Click on New Integration. 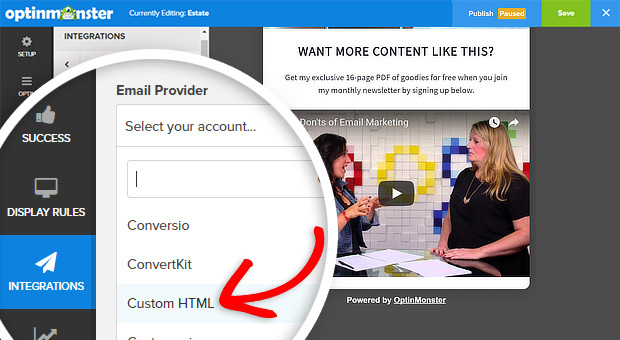 Under Email Provider, select Custom HTML. Paste the embed code. Your campaign will automatically update to show the video. Change display rules if necessary, as described above, then Save and Publish your campaign. You can use this method to create a WordPress video popup on page load, by embedding the video into a fullscreen welcome gate. That’s it! If you enjoyed this tutorial, check out our tutorials on how to create campaings targeting adblock users and how to schedule your OptinMonster campaigns.